Highlights from the What Hi-Fi? 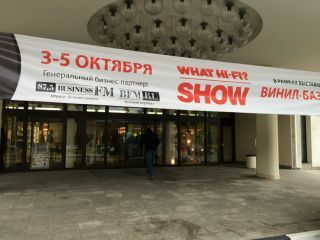 Show in Moscow | What Hi-Fi? The What Hi-Fi? Show in Moscow is in full swing this weekend, covering three floors of the Iris Congress Hotel in the north of the city. There are many familiar British and European brands here – Naim, Focal, PMC, Tannoy, Musical Fidelity, Chord Electronics, Pathos and Copland among them – as well as some domestic Russian ones we haven't previously come across. Russian hi-fi buffs are clearly into their vinyl with a large selection of secondhand records on sale in the 'vinyl bazaar' and plenty of high-end turntables on show. What's notable is the lack of home cinema - this is very much a pure audiophile show, and a relatively high-end one at that. So far I've only seen one home cinema demo, and that was using a 2.1 system. Not much mention of Dolby Atmos here, unlike at the CEDIA Show in Denver a few weeks ago. Everyone agrees that business is tough here right now – the political situation in Ukraine and economic sanctions are not helping. Even getting spare parts imported from Europe can be a struggle according to some distributors I've spoken to. But most of the exhibitors are determined not to let the economic situation dampen their enthusiasm for all things hi-fi. Naim is launching its new Muso system in Russia at the show, Chord Electronics is making the most of the success of its highly-acclaimed Hugo DAC and it was good to see the likes of the KEF LS50s, Tannoy Definition DC10s and Focal Utopia speakers getting a welcome reception. Other highlights were the extraordinary looking Slonov Sound Design 200 Series speakers (pictured above), a powerful (and loud!) demo of the Gato Audio CDP-1 CD player and matching AMP-150 amp which were exhibited along with the new Gato DIA-250 and DIA-400 Class D integrated amps, and an impressive display of the Copland CDA825 CD player, CTA305 preamp and CTA506 valve power amplifier. Meanwhile, in the Audiomania room we couldn't help but notice the eye-catching Arslab Old School Superb 90 speaker in its special orange finish. This three-way speaker is even bigger than it looks in the picture and is expected to cost around £1200 in the UK where it will be available in more traditional finishes. Impedance is 6ohms and sensitivity 86dB/w/m. And we've seen it before of course, but who can resist the Nottingham Analogue Anna Log turntable? You can see pictures of these and many more of the exhibits from the Moscow Show on our Facebook and Google+ gallery pages.